Palak tofu is similar to palak paneer. 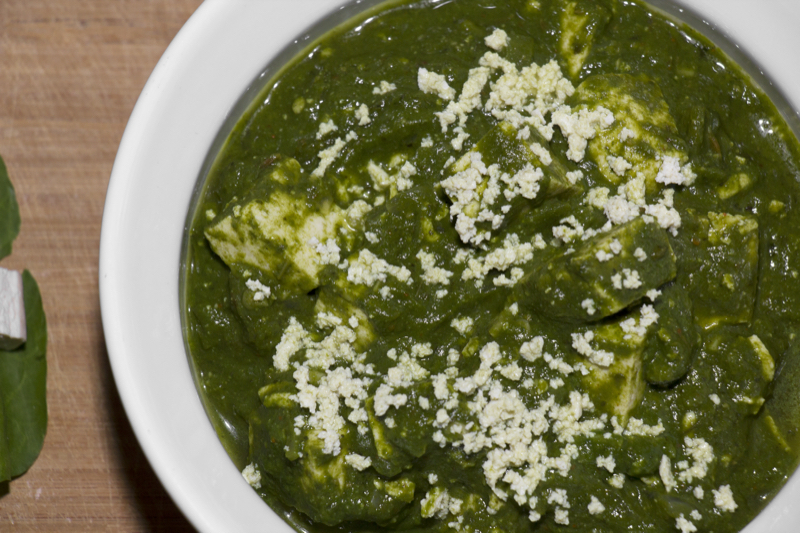 Palak paneer is one of the most popular North Indian dishes. 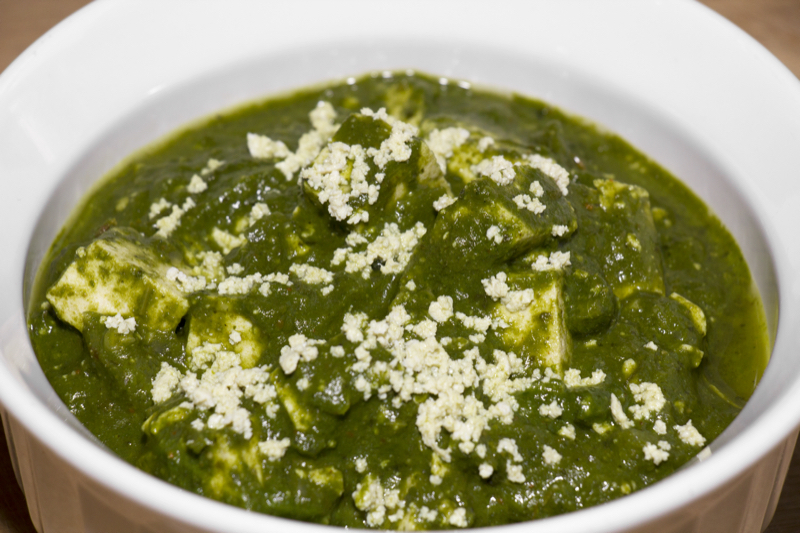 It is basically paneer (a type of soft cheese) cooked in creamy spinach gravy. Paneer is calorie dense and is loaded with fat especially saturated fat and cholesterol, both of them promote inflammation and heart disease. Tofu is made from soybeans. It is a much healthier alternative to paneer. Serves 6-8, Cooking time including preparation 30 minutes. In a vessel boil 4 cups (1 litre of water), add chopped spinach, one teaspoon of sugar (to avoid discoloration of spinach), and cashews – let them boil for 5-6 mins. Strain water (Keep the water aside). Let the spinach cool down in cold water. Grind it to puree. In a pan – dry roast jeera (cumin) for 1 min. Add ginger and garlic. Saute for 30 secs. Add onions and salt – let them cook for minute. Add chilies, mix well. Add Spinach/cashew puree – stir it and let it cook for 2 mins. Add one cup of strained water (saved from boiling spinach), coriander powder, cumin powder. Cover with lid and cook for 3 mins. Add garam masala, methi powder(dried fenugreek, optional), tofu and salt and cook for 5 mins. Garnish with coriander leaves. Use grated tofu to garnish further after transferring it out in a serving bowl.